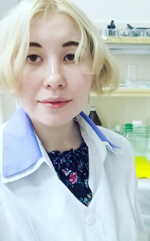 2013-2017 Kemerovo State University, Institute of Biology, Ecology and Natural Resources, Department of Genetics. Theme of the final bachelor's work: "The study of qualitative and quantitative characteristics of DNA extracted from samples of frozen blood using a commercial set of K-Sorb reagents". The theme of the master's work is: "Genetic structure of Siberian pine (Pinus sibirica Du Tour) populations on the eastern macroslope of the Kuznetsk Alatau."